She has a great tutorial on these. 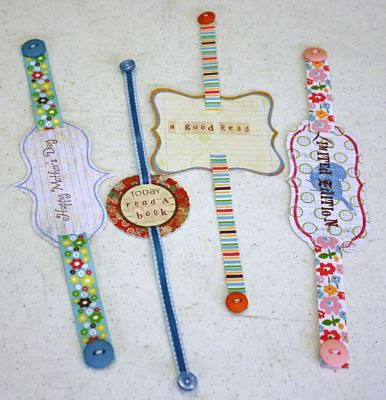 They would make great little Mother Day's gifts for the kiddos to make. Very fun!! The supplies are 10" of ribbon, 2 coord. buttons, journaling tags, alpha stickers, needle and thread. If you want to stamp on them - what a great look. I made these in about 30 minutes. Have fun and thanks for stopping by. I just stumbled upon your blog and LOVE what you create!! !